Is Gazprom cutting the Turkish Stream in half? Gazprom is halving capacity for its Turkish Stream pipeline, which extends from Russia to Turkey and then to southern Europe. The Russian natural gas monopoly has cancelled a deal with an Italian contractor to lay Black Sea pipelines. Experts believe that the Turkish Stream is now destined to be a local project. Gazprom, the Russian gas monopolist, is halving the transit capacity of the Turkish Stream pipeline, which extends from Russia to Turkey and then to southern Europe, cutting to 32 billion cubic meters the volume of gas it can carry. Business daily Kommersant says the company has frozen its investments in the South Corridor project, which was supposed to take gas to the future pipeline. Market observers say that the Turkish Stream may turn into a local Russian-Turkish project, and that Gazprom will instead expand its North Stream pipeline in the Baltic Sea. The South Corridor project was planned to supply gas to the South Stream pipeline, which was supposed to run along the Black Sea seabed from Russia to Bulgaria, and after the South Stream was cancelled, to the Turkish Stream. Kommersant says Gazprom halted work on the eastern - the longest and most expensive - branch and now plans on finishing the western branch. The length of the western branch is 547 miles and the eastern - 1,010 miles. At the start of 2015 Gazprom invested almost 300 billion rubles (£3.3 billion/$5.2 billion). Gazprom has declined to comment. Italian contractor Saipem says that it has received a notice from Gazprom stopping their collaboration. A vessel belonging to the Italian company had been moored in Russian waters, waiting to start laying the pipeline on the seabed of the Black Sea. Gazprom has agreed to pay all penalties associated with the six months it had kept Saipem waiting, which Kommersant says amounts $300 million. The Russian government denies there is any relation between the annulment of the contract and the possible reduction of the Turkish Stream's capacity. "The cancellation of the contract between Gazprom and the Italian contractor Saipem will not influence the Turkish Stream project," Alexander Novak, Russia's energy minister, claims. "The South Corridor project is a priority for Gazprom. It is actively being carried out and no one plans on 'freezing' it," Dmitri Baranov of consultants Finam Holding says. "Furthermore, a significant amount of work has already been done on the project." If the Turkish Stream project is cut back, it will be transformed into a local project that will supply gas only to Turkey, he adds. 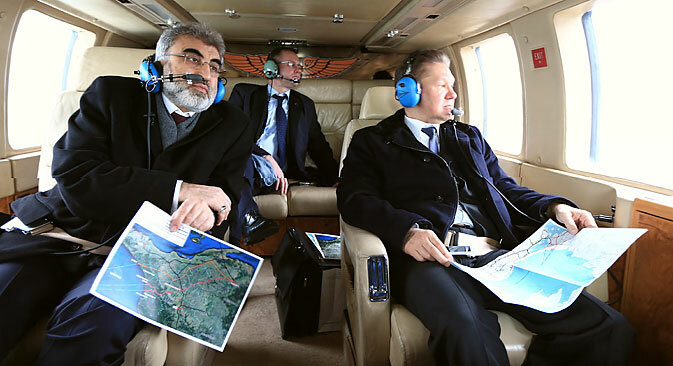 "As of today no agreements on gas transit through Turkish territory have been signed," Baranov says. "If the agreement on transit is signed, then it will be yet another direction for Russian gas supplies to Europe. But it will only add to the existing directions, not replace them." In June 2015 Gazprom, Shell, OMV and E. On signed a memorandum on the construction of a second North Stream gas pipeline in the Baltic Sea with an annual capacity of 55 billion cubic meters. "The signed memorandum, in essence, is only an agreement of intent, it is not binding," says UFS IC chief analyst Ilya Balakirev. The existing two branches of the North Stream are only half loaded due to regulations of the EU's Third Energy Package, he says. EU anti-monopoly rules forbid one company from supplying gas and controlling its transit. Ideally, Gazprom would like to have both projects, but it is important for the company to show its partners that it can effectively renounce one project for the other, as it helps strengthen a company's negotiating position, Balakirev adds.